If you notice your tires are out of balance, go to a mechanic/tire technician or balance them yourself. Tire imbalance is a condition when the weight of a tire is unevenly distributed around the tire-wheel unit circumference. The comfort of your ride and the lifespan of your tires, wheels, and suspension, greatly depend on it. 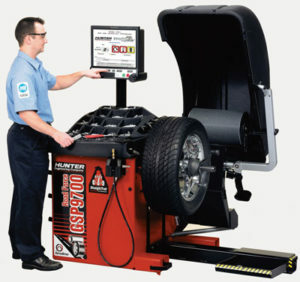 A mechanic or tire technician will put your wheel-tire units on a balancing machine one-by-one. Usually, the unit spins and the machine diagnoses it to find stiffer spots and measure vibration. The results show whether the weight is balanced, and if not, where to apply weights. The specialist then applies steel, aluminum, zinc, or lead elements, opposite the stiff spots. The process usually takes about an hour for all four wheels. Sometimes, additional weights are enough to fix a tire that is out of balance. However, the technician may need to rotate the tire on the wheel. The reason for this is that the heavier spot of the wheel and that of the tire may line up, causing more imbalance. Another thing to do is to check for locking wheel lugs. They are about 1.5 times heavier than usual lug nuts, so they can add about 0.5 oz weight to the side of the wheel. The cost of procedures if tires are out of balance may vary from $15-$80 for four wheels. The amount may vary depending on the location, warranty, tires, and additional procedures. The average price is about $10 per wheel ($40 for four wheels) at a tire shop, and $12-$14 ($48-$56) at a car dealership. Some shops offer free services of mounting, balancing, and/or rotating, if you buy the tires from them. There are also shops that offer a lifetime service if you buy from them, so make sure to ask about this before purchasing. You can find all certified tire shops that can help if your tires are out of balance in The National Institute for Automotive Service Excellence’s database. Static balancing involves weights being added across only one line of the tire, which is called one plane, as if the tire was a disc. It is an old-school method which is the easiest to perform and is helpful in light-imbalance cases. 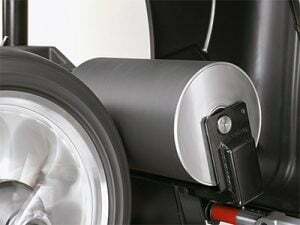 If tires are out of balance, each is placed on a vertical supporter with a spindle tool or a bubble balancer. The heavier side will lean lower to the ground, showing that 180° across from it is where your mechanic should place a weight. Eventually, the weights will be only on one side of the wheel, which is good for those who don’t want them on the outside. However, if the imbalance is more complex, this method may be insufficient. 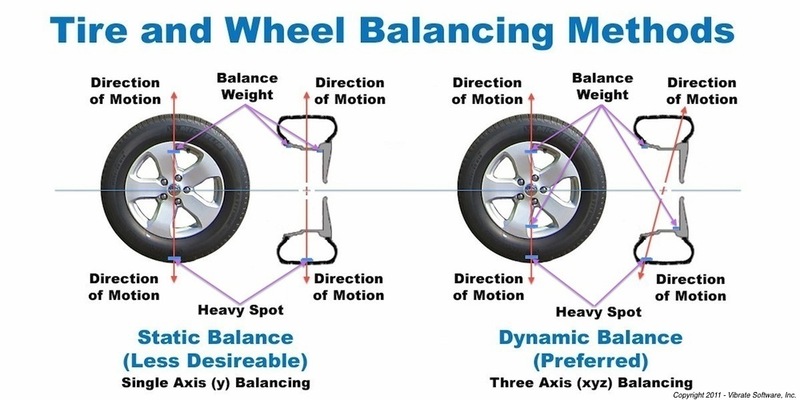 Dynamic balancing involves having the weights spread across the tire (side-to-side, up and down), which is dual plain. Mechanics use modern spinning computer balancers for this procedure. The technician places the wheel-tire assembly on a machine, which then spins at certain speeds. During manufacturer tests, the speeds are usually from 10-15 mph to 55-60 mph. While the unit spins, the sensors of the machine measure all weight imperfections. Spin balancers don’t just show the location of the stiffer spots if the tires are out of balance. They also measure how much weight your mechanic should apply to fix the situation. The weights are on both sides of the wheel in this case, and it also provides more precision and balance. Plus, some of wheels have a “positive offset”, meaning most of the wheels’ surface is inboard. In such a case, the outer elements can be behind the wheel’s face, while the inner can be on the inside part. Road force balancing is one of the newest technologies that creates road conditions simulation. The machine has a large roller that presses on the tire, applying the estimated weight of the vehicle. 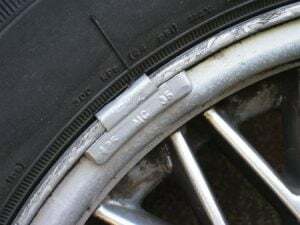 This method can detect if the tires are out of balance even in complicated cases. Such machines also have different “tolerances” that fit different types of vehicles. During the process, sensors read the pressure around the circumference, detecting irregularities. If there is too much variation, the system shows the technician a message to take readings from the wheel. The machine then determines whether the tire or the wheel is the cause of the issue. It also shows whether the two items can be re-matched to meet the chosen tolerance. If so, the system specifies the spots to work with. The technician then lubricates the bead and turns the tire on the rim to achieve the lowest level of road force variation. The machine doesn’t always get the spots right the first time, and there are certain details the technician should know. However, this level of precision is impossible with static or dynamic balancers. NOTE: Tire manufacturers won’t replace your tires if they are out-of-round if you have been using them for some time. However, if the tires are out of balance when you mount them for the first time, it’s better to contact the manufacturer. 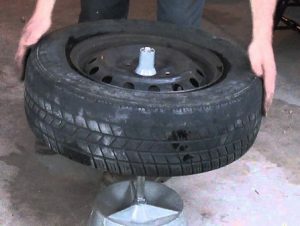 If your tires are out of balance, you can fix them yourself at home/in your garage. You can balance tires with or without a balancer. However, you must know the mechanical parts of the wheel and the vehicle overall. You will need a screwdriver with the flat end, a lug wrench, and a jack, to remove the wheel. To balance the tires, you will need a balancer and various wheel weights. Remove all the weights you already have on your wheels before rebalancing them. Remove the wheels from the vehicle. Remove all the debris and dirt from the tread, the rest of the tires, the rim, and other parts of the wheels. Then wash them if needed, and let them dry. Put the assembly on the balancer and follow the manual (spin the wheels if you use dynamic balancing, wait until the tires settle into a stationary position if you use static balancing). Use chalk to mark the spots where you will put the weights (opposite the heavy spot) if the tires are out of balance. Put on the weights and recheck the balance. Adjust the weights until the tires move smoothly (dynamic) or stay in a perfect line (stationary). Put the wheels back on the vehicle, tighten up the lug nuts, and lower the jack. NOTE: The balancing routines may vary from machine to machine, so make sure you consult the manual before using. This method is universal and only provides the basic steps you need to take. If you have no machine, you still can balance your tires yourself by trial and error. You will need the tools to remove the wheels and the weights. Choose which wheel may be the cause of the imbalance. Remove all additional weights from the wheel. Clean the wheel on the vehicle thoroughly, removing all the debris from the tread. Install the weight on the 12 o’clock position and rev the car to the speed where the vehicle starts vibrating, increasing it a little bit (+5-10 mph) at a time. If the vibration is still present, replace the weight at 45° from the initial position. Accelerate again at the same speeds, and if you notice the vibration starting speed moves higher, add more weight to that spot. If you still didn’t get rid of the vibration, move a further 45° and continue with the same procedure. Eventually, you will find the spot, then add more weights if necessary, and the balancing will be complete. You can watch this video for better understanding. NOTE: You can detect what tires are out of balance if you rear-front rotate your tires and notice vibration afterwards. Rear tire imbalance may have been insignificant while it was at the back. Also, the type of vibration can give you a hint. If the tremor is mostly in the steering wheel, the front tires are most likely imbalanced. If the vibration is in the seat and floor, the rear wheels need attention. In other cases, you may need to test all four tires. IAW for many European and South Korean cars. These are universal, easier-to-install weights – 0.25 oz (7.09g) squares with strong adhesive on one side. Their main place of use is the inside of the wheels, where the tires are out of balance. 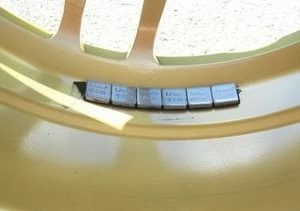 Some drivers also use duct tape to strengthen the position of these weights. With heat accumulating, especially in racing tires, the main adhesive may melt, so duct tape is a backup. Technicians also recommend cleaning the surface of dirt and dust before applying these weights, to make sure they stick on strong. Such weights became necessary when aluminum alloy wheels became popular. Placing clip-on weights on them can lead to damage that can cause corrosion. The same applies to chrome wheels, as any slight damage may cause flaking. If you notice any of these irregularities, make sure to check tire balance, even if the tires are relatively new. When your tires are out of balance, you may feel irregular vibration at 40-45 mph. It usually worsens as you increase the speed, and can cause vehicle occupant drowsiness. The tremor may be too insignificant for you to notice if you only drive along quiet streets. This is because some vibrations don’t occur until the car reaches 50-70 mph. The type and intensity of vibration may depend on the weight and size of the wheels and the vehicle. The vibration also differs by the level of steering/suspension sensitivity towards vibration. Also, keep in mind that out-of-balance tires are not the only possible cause of vehicle vibration. If your tires are out of balance, they may eventually patch-wear. This is one type of tire wear pattern that is mostly random, meaning that it wears in different spots around the circumference. This happens because of the vibration and shaking that imbalanced tires causes. You can check treadwear if you have any suspicions, using the penny test, tread depth gauge, etc. Make sure you don’t check just one spot, go around the tire, and in and out. If you see a difference in 1/16” or more, your tires are wearing unevenly. And if the wear is in random flat spots, it’s most likely because of imbalance. Bearings, shocks, and other elements of a car’s suspension may suffer, due to frequent vibration. This happens because of the partial loss of traction and vibration, since the tires are out of balance. Moreover, problems with suspension usually cause cupping – a type of treadwear that appears in regular spots across the tire. It may also contribute to the vibration of the vehicle and partial traction loss, which will cause more damage. When tires are out of balance, they often partially lose traction with the road, increasing fuel consumption. 1 oz of imbalance at 60 mph usually causes 7.73 pounds of excess force per revolution. And for every extra 7.73 pounds, a vehicle will use an equal amount of excess fuel. Fuel economy also depends on the severity of the imbalance, the type of tires, and the speed. The greater the imbalance and the higher the speed, the more fuel waste there is. The heavier the tires with the imbalance, the less fuel efficient the car becomes. Furthermore, tires provide greater fuel efficiency when they are 50-80% worn. However, if the tires are out of balance they wear unevenly, which makes them inoperable sooner. 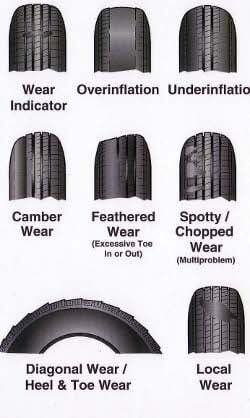 These facts relate to all kinds of driving tires. According to the American Trucking Association’s Technology & Maintenance Council (TMP), tire balancing is a highly recommended practice. Even trailer tires, which usually lack attention, should be in balance, to maintain and even improve fuel economy. Tire/wheel runout is when the tire isn’t perfectly round, which is both a sign and cause of imbalance. If the high spot of the wheel aligns with the high spot of the tire, the imbalance is greater. The runout can be radial or lateral, meaning that the tire may be deformed vertically or on the sides. Tire technicians usually manage to balance runouts by match-mounting the tire on the wheel. Eventually, the high spots balance each other, and if there are no other issues, the vibration disappears. For the tires to operate regularly, the runout should be no more than .030” to .050”. A team of researchers from SAE International (initially the Society of Automotive Engineers) used anti-lock braking system (ABS) wheel speed sensors and brake control module data, in order to recognize tire imbalance. They managed to detect whether tires are out of balance while on the go, and developed a two-stage system based on the results. In 2011, the researchers introduced a paper proving this. Many drivers confuse these two terms. Tire balancing is achieving equal distribution of weight around the circumference of the tire. Wheel alignment is adjusting the wheel’s position so it’s perfectly perpendicular to the ground and parallel to other wheels. Remember that the balance of your tires may disappear as the tire wears, and the weight distribution alters. Also, everyday stress, bad roads, hard braking and cornering, etc., may disrupt the balance over time. So, balancing new tires once you mount them may not be enough.